This… this was awesome. Huge thanks to Jesse Agler, Randy Jones, and the Padres for letting me join in on the television fun. 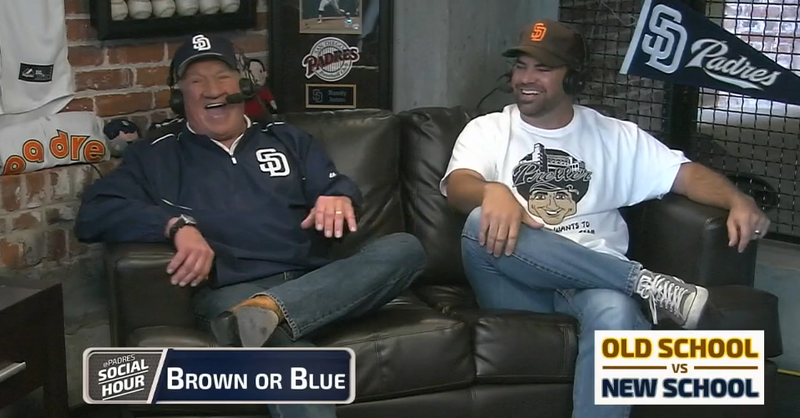 This was a brand new segment for Padres Social Hour, “Old School vs. New School” – and it was a blast. I think I may have gotten hosed on the scoring, but I couldn’t care less. I loved every minute of it… starting with me telling RJ, “I’m saving up my good answers for when I debate your face off.” Who says that? I was just going to post the video, and let it speak for itself, but I’ve decided to share a little bit more about it. On the surface, I try to play these things pretty cool. I don’t freak out over celebrity or athlete sightings/interactions… I try to act like I’ve been there before in any social setting. But every once in awhile, it helps me to take a step back and reflect for a second on the neat things that I’ve been able to do in life. This is one of those neat things in life. First things first, I’m a nobody in the baseball world… I’m a nobody in the blogging world. I recognize this. I’m a somebody to my two kids, 3 and 5 years old, that’s it. To everybody else… a nobody. I’m fine with that too… but it speaks to how cool it is that I was able to do something like this. “Oh man, you are so doomed.” – in reference to my debate skills. “Your hat is stupid” – after he questioned the authenticity of mine. “Have a little conviction” – because he’d only brush back a hitter, not bean him. “Maybe you should’ve done a little research” – in reference to my non-professional baseball career. “You were a pitcher, you wouldn’t understand” – that one is especially good since I was referring to his knowledge of batting. RJ finished his career with 599 MLB at-bats, I finished mine with zero. Couple of other random notes… 1) well played on the Jeff Cirillo drop, Jesse. 2) Neither RJ or I had seen the questions ahead of time. 3) I don’t think anybody understood my reference to Jordan Baker and #GumGate when I said I’d never argue with an umpire. 4) If you liked my t-shirt, you can buy it here. It is, of course, a reference to this San Diego legend. 5) Here’s to hoping I get to do this again sometime. This entry was posted in Baseball and tagged jesse agler, Padres, padres social hour, Randy Jones. Bookmark the permalink.